Unfortunately, the large round loom that I am using for my current WIP (Work In Progress) Fascination Cape was too big to work on in the vehicle. I have been trying to finish up my WIP's and was looking forward to some quality looming time this weekend at our cabin. Sooooo ... I started a new project, one that is easier to work on in a confined space. I had these two skeins of Bernat Mosiac in my stash, and decided it was time to actually make Lisa Sawyer's Waves of Lace Shawl. I've been using her pattern sequence for all kinds of things lately but have never actually used the pattern as written. The yarn is a little stiff, so this is one piece that will require blocking when it is done. I think it will open up the lacework beautifully, and I will remember to take a Before Blocking picture and After this time around. It is working up quite quickly, and the two skeins will be plenty. I'm loving the pastel colours and the variation - it's going to make a lovely Spring shawl! 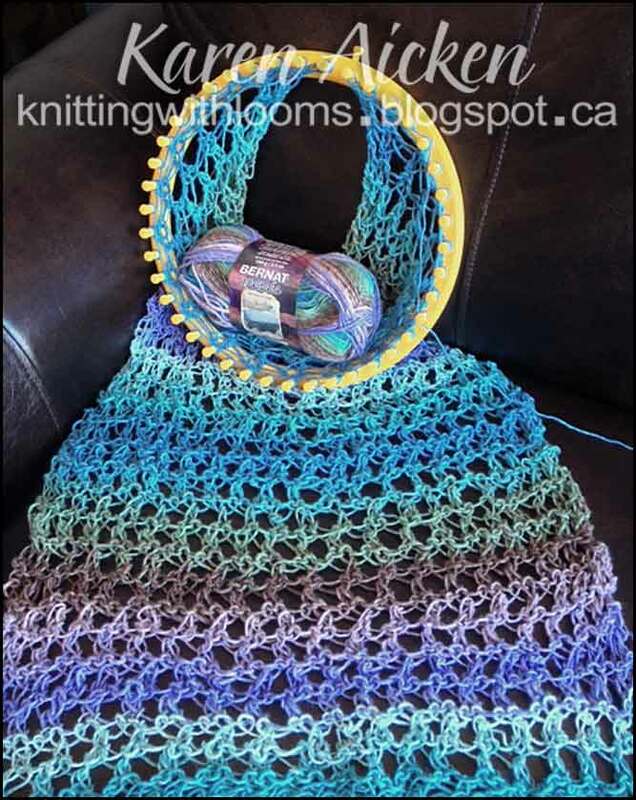 Where are the instructions on how to do this 'Wave of lace' shawl??? Please send me the instructions and / or where to find it on u-tube. Knitting With Looms Blog is a personal hobby blog with the sole purpose of sharing paper crafting projects. I don't make use of any personal information shared in any comments or any third-party applications such as email subscription services.